CHATELAIN - [Title page] Atlas Historique. Tome II. CHATELAIN, H. - [Title page] Atlas Historique. Tome II. [Title page] Atlas Historique. Tome II. - CHATELAIN, H.
Title : [Title page] Atlas Historique. Tome II.. Size : 15.4 x 9.4 inches. / 39.0 x 24.0 cm. 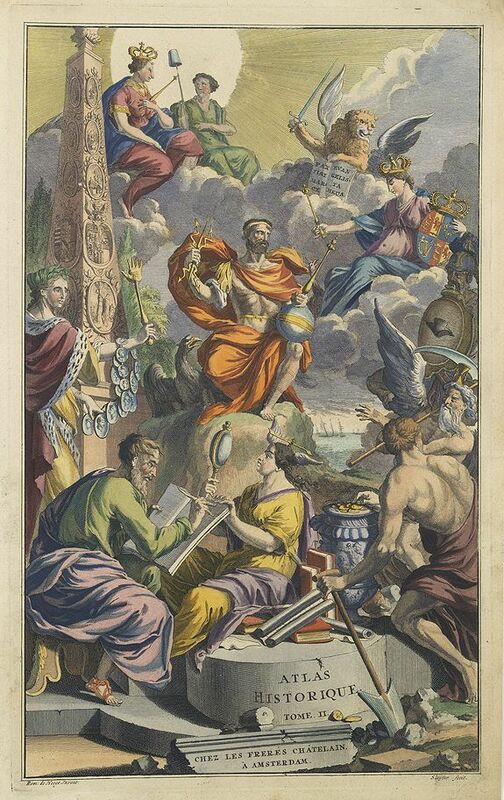 Description :Printed title page in beautiful hand colour, filled with allegorical figures. Prepared by Romeijn de Hooghe and engraved by Sluyter. Condition : Very slightly age toned. Dark impression.